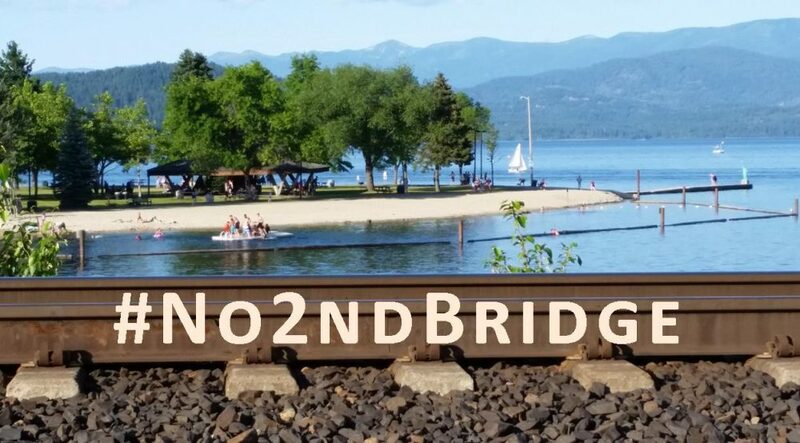 Thanks to the volunteer, Sandpoint, Spokane, and Vancouver activists who participated in Stop Oil Trains in Idaho 2017 Actions on July 6 to 8, commemorating the fourth anniversary of the oil train derailment, spill, and fire in Lac Mégantic, Quebec, and honoring the 47 disaster victims and all lives impacted by oil-by-rail traffic and accidents [1, 2]! On Thursday evening, July 6, we gathered at the Gardenia Center in Sandpoint, Idaho, for a Skyped, oil train watch training workshop presented by Matt Landon of Vancouver Action Network in Washington. Besides sharing handouts, information, and insights on methods of observing, documenting, and reporting Northwest fossil fuels trains, we conversed about train characteristics and Wild Idaho Rising Tide’s (WIRT) commitment to the skills and successes of non-violent, creative, civil resistance. 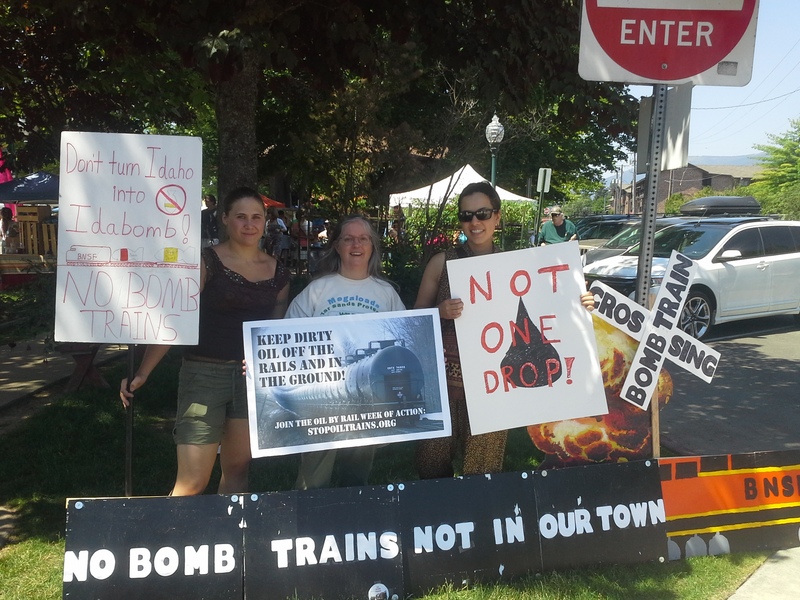 Occupy allies from Spokane, Washington, joined us for a family-friendly demonstration against oil trains, with homemade, protest signs around the Farmin Park clock tower in Sandpoint, on Friday evening, July 7. We soon moved to the Church Street silos near Evans Brothers Coffee Roasters, for their light projection display of social and climate justice messages, seen from the surrounding neighborhood and U.S. Highway 2, as the sky darkened. We posted photos of the light show on social media, distributed WIRT brochures, and discussed Northwest oil train and terminal issues with curious passersby on foot and bike. 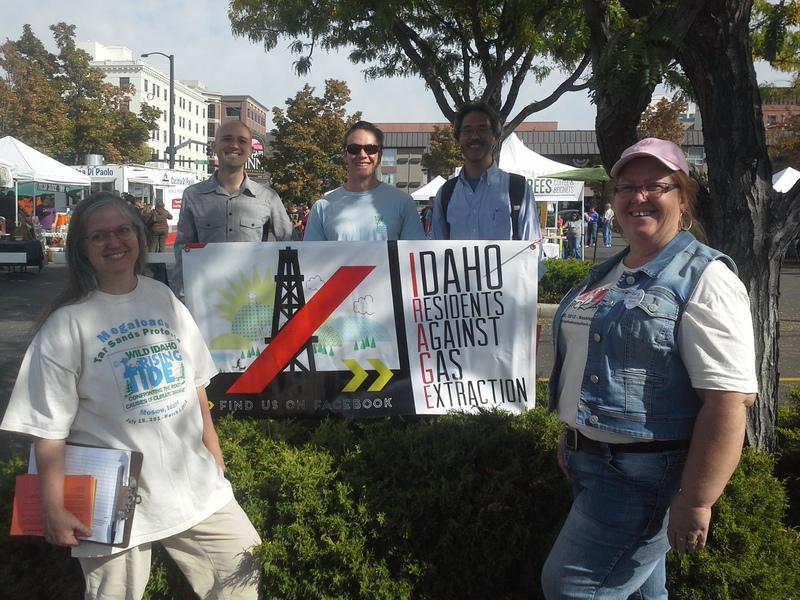 On Wednesday, October 15, 2014, beginning at 8:30 am MDT, Idaho Residents Against Gas Extraction (IRAGE), Wild Idaho Rising Tide (WIRT), and allies converged and protested for a second time another auction of oil and gas leases of state lands and sub-surface mineral rights conducted by the Idaho Department of Lands (IDL) for the Idaho Board of Land Commissioners . Held in the Idaho Department of Fish and Game Trophy Conference Room in Boise, Idaho, the public meeting offered 11 tracts totaling 5,250 acres in Cassia, Gem, and Owyhee Counties, including 600 acres in Cassia County and 160 acres in Gem County of state lands and 4,479 acres in Owyhee County of split estates with private landowners and state mineral holders. Although citizens at the auction observed four bidders, only the drilling companies Alta Mesa Idaho of Houston, Texas, and Trendwell West of Rockford, Michigan, paid an average of $46 per acre on purportedly competitive, oral bids for subsequent ten-year leases [2, 3]. Increasing the current tally to nearly 98,000 leased state acres (besides thousands of leased private acres in six southwestern counties), IDL raised $263,000 from the auction of state public trust and endowment trust lands and minerals for oil and gas exploitation, “benefitting” the general fund, state wildlife and transportation departments, and specific educational and beneficiary institutions. The state will receive a 12.5 percent royalty on any resulting oil and gas extracted from producing wells impacting lands, resources, and waterways at bargain prices. During the week of August 10, grassroots groups and peaceful protesters coordinated and staged regional actions against increased coal train traffic in interior Northwest communities and West Coast coal exports [1-3]. 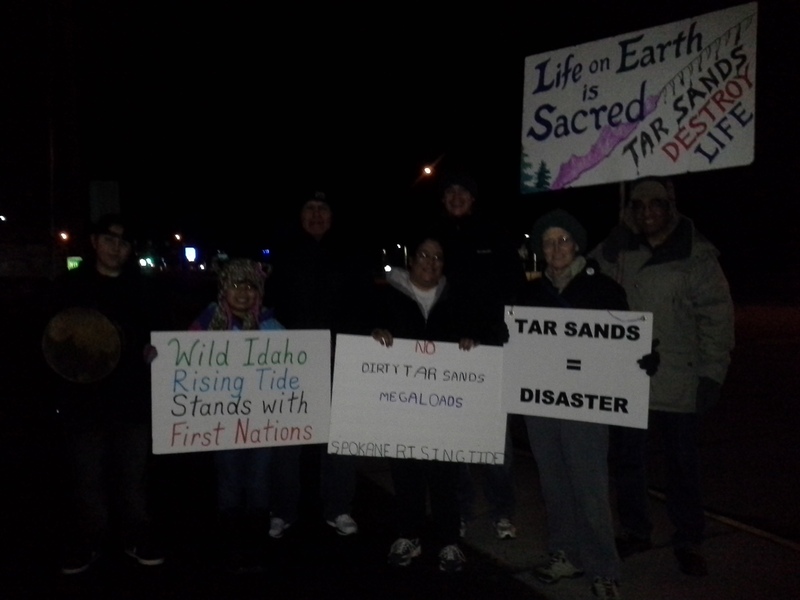 Sponsored by several climate and tribal organizations, including 350-Missoula, Blue Skies Campaign, the Confederated Tribes of the Umatilla Indian Reservation (CTUIR), Indian People’s Action, and Wild Idaho Rising Tide, activists held gatherings, speeches, rallies, marches, and train blockades in eastern Oregon, Idaho, and Montana. Together, they catalyzed growing inland Northwest opposition largely dismissed by federal and state regulatory processes determining the fate of Powder River Basin coal mines and three proposed coal export facilities at Cherry Point and Longview, Washington, and Boardman, Oregon. On Tuesday, August 12, over 40 dedicated people from western Oregon and about a dozen folks from eastern Oregon traveled up to 12 hours via bus and passenger vehicles, through summer storms with wind gusts, heavy rain, and lightning, to the Port of Morrow conference center in Boardman, Oregon . At the Oregon Department of Environmental Quality (DEQ) public hearing on a 401 water quality certification for Ambre Energy’s Morrow Pacific coal train terminal, coal export opponents convened a lovely pre-hearing picnic, packed the room, and voiced resistance through about 75 percent of the amazing citizen testimony and inquiries during a DEQ question-and-(un)answer session. 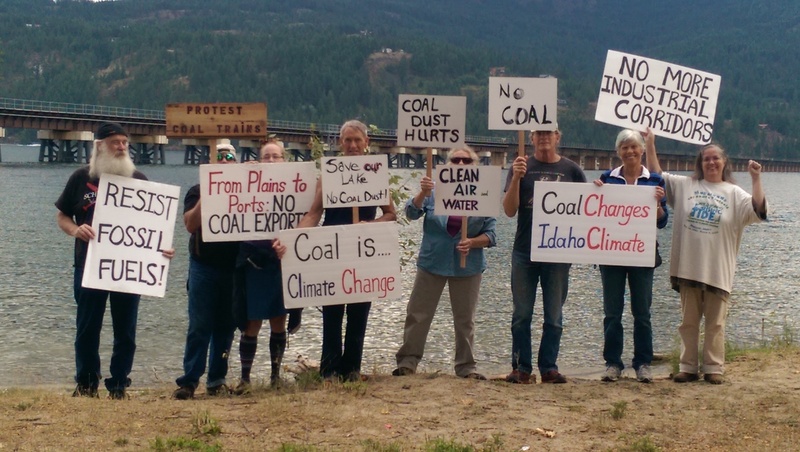 Among health professionals, longshore and warehouse union workers, and eastern Oregon residents, Umatilla tribal representatives spoke powerfully against coal export impacts, offering many compelling reasons to deny state permit approval. Chief Carl Sampson of the Wallulapum Tribe of the CTUIR welcomed coal export opponents and offered strong words, as did his daughter Cathy Sampson-Kruse, his granddaughter Mariah, and Umatilla Board of Trustees Chairman Gary Burke. Saturday, August 16, brought nonviolent civil disobedience to a Missoula, Montana, rail line for the second time this year, as Montana writer Rick Bass and three concerned Missoula community members stood on both sides of train tracks and temporarily delayed a coal train . While 50 supporters cheered from the sidelines and forced an inbound coal train to crawl through Hellgate Canyon, police arrested and removed the four brave protesters from the path of the oncoming train in the railroad right-of-way, citing them for trespass and releasing them for appearances in court next week. In April 2014, police similarly arrested seven people during civil disobedience that delayed an outbound train carrying coal. Author of nonfiction novels and books, Rick Bass read from his current work to the gathering of coal export opponents and asserted that uncovered, dirty coal shipments by rail through Montana towns, moving all the time through all kinds of weather, violate the Montana constitution and contribute toward still correctable climate change. 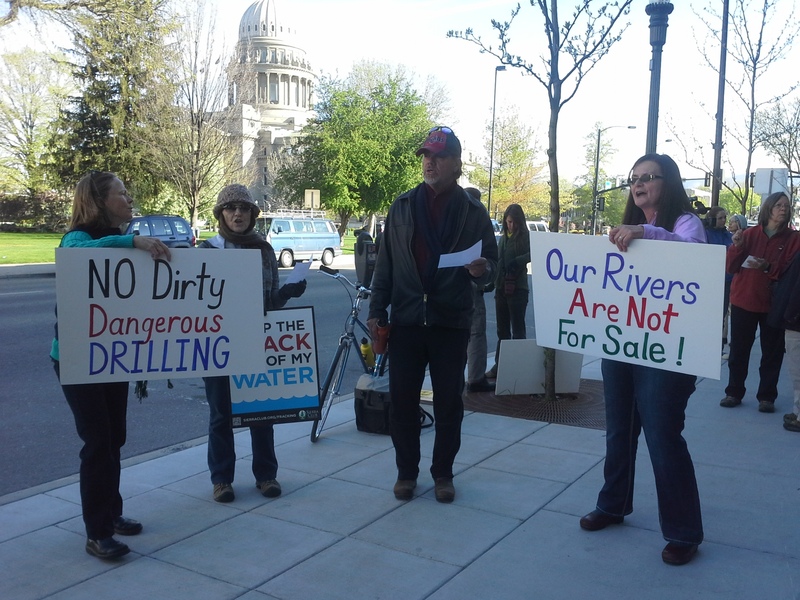 On Thursday, April 17, 2014, twenty members of Idaho Residents Against Gas Extraction (IRAGE), the Muse Project, and Wild Idaho Rising Tide (WIRT) staged a successful protest of the Idaho Department of Lands (IDL) auction of oil and gas leases of state rivers, lands, and mineral rights to the highest bidders among two drilling companies [1-4]. Converging at 8:30 am MDT outside the IDL main office in Boise, Idaho, participants arrived with their protest signs, friends, and family members, including an infant and toddler, and their spirit of solidarity with communities devastated by fossil fuels. Together they sang multiple rounds of the climate activism song Do It Now near the IDL entrance, as five or more news agencies interviewed and filmed the demonstrators, and as bidders, government officials, and their associates hurried inside. When protesters filed into the building only minutes before the auction began, the receptionist insisted that they could not bring their posters or voices to the auction. One organizer asked to see the Idaho code that disallowed this practice, and the crowd soon occupied and packed the back of the conference room. As bids on 150 public tracts started at $1 per acre and ended as high as $505 per acre, some defaulting to Alta Mesa without competitive bidding, the demonstrators held their protest signs, placed them on tables surrounded by bidders, and scrutinized, videotaped, and photographed the proceedings among irritated oil and gas industry representatives. 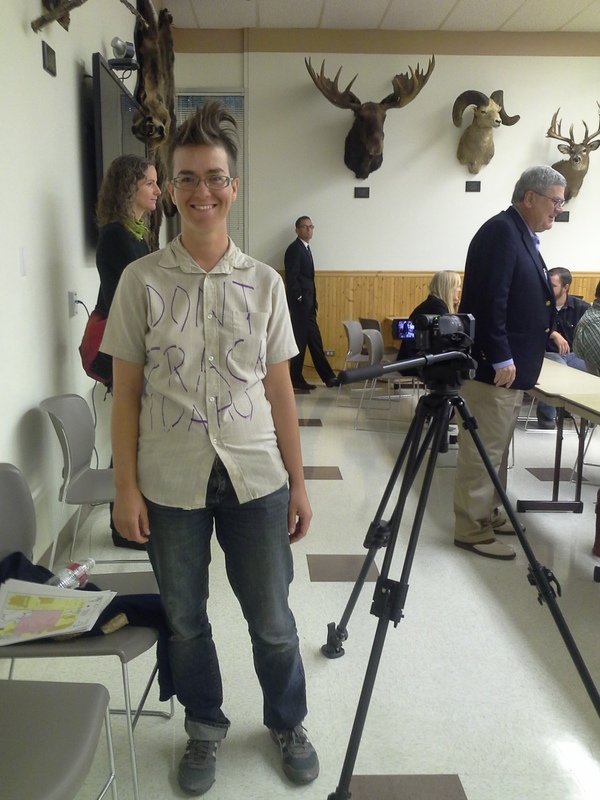 Immediately after the auction concluded, two activists asked how the public can comment before state auctions on parcels of their lands and minerals planned for fossil fuel development leases. To expand Idaho citizens’ right to knowledge of these lands as well as more stringent water protections for leased rivers and increased public engagement in leasing processes, they also requested comprehensive maps of the leased parcels and the auction’s list of tracts, leasees, and bids. 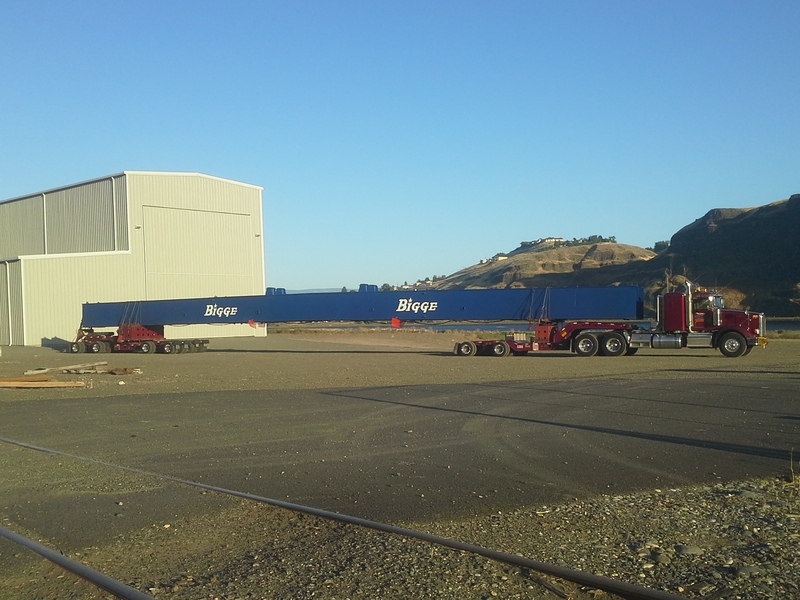 Between April 11, 2011, and March 6, 2012, Mammoet hauled over 70 transports weighing up to 500,000 pounds on U.S. 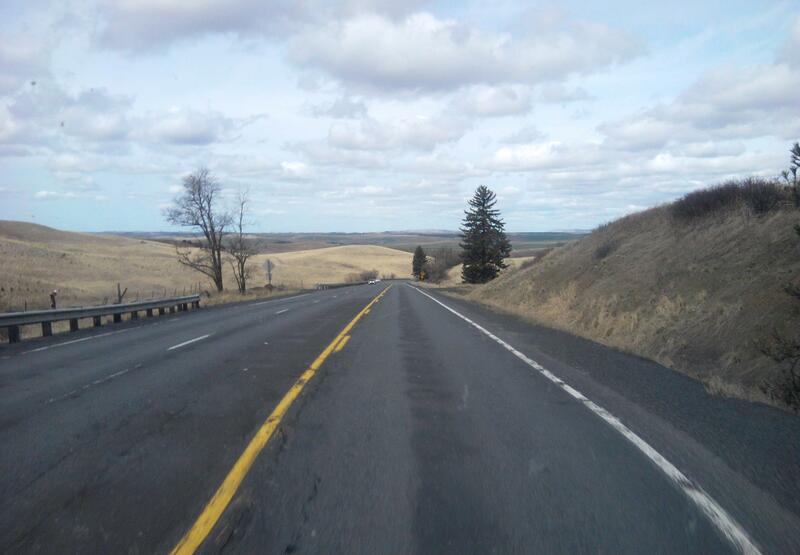 Highways 12 and 95 and Interstate 90 through northern Idaho, between the Port of Lewiston and Lolo or Lookout Pass and into western Montana. Expensively and dangerously facilitated by the Idaho Transportation Department (ITD), state police, and private contractors, its risky Imperial Oil megaloads imperiled the safety and schedules of travelers, while delaying, confusing, and blocking public highway access and traffic with their 16- to 24-foot, two-lane widths and lengthy, glaring cargoes and convoys. Transport operations caused personal injury and property damage through numerous accidents and collisions with vehicles, tree branches, and power lines, as they degraded highways with washboard ruts in lane centers, and pummeled saturated road beds, crumbling shoulders, and outdated bridges [1-3]. Concurrent, colossal transportation ventures through the region, imposed by other haulers, crashed into cliffs and impeded public and private emergency services [4, 5].